FREE SKIDEPOT directly on the slopes. Only on direct bookings! The individual south-facing terrace of this quiet ground floor suite offers you an incredible mountain view. 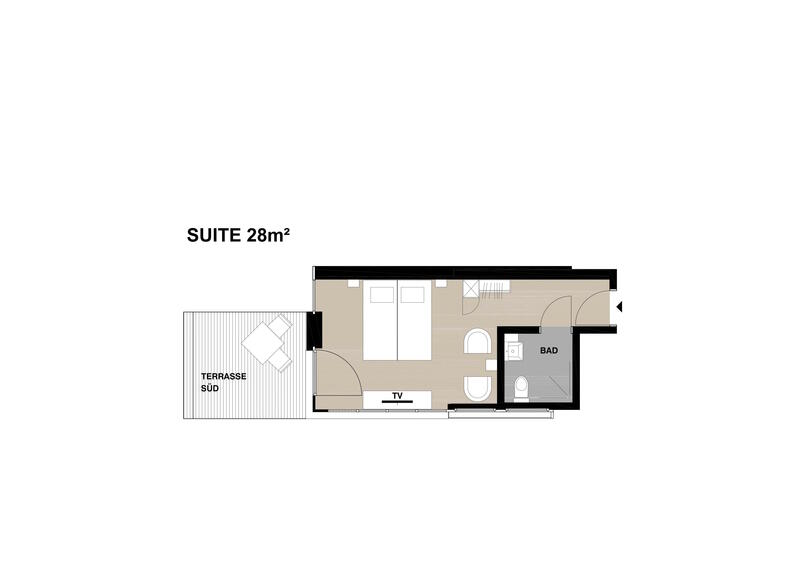 And with the modern box spring beds (1.80m x 2.10m), bathroom with rain shower, sitting area with fridge, electric kettle and Nespresso coffee machine, your wellbeing will be increased even more. An open bathing area with rain shower and a separate toilet are the special features of this suite. Situated quietly, it offers a stunning view of the surrounding 4000m peaks from the south-facing balcony. 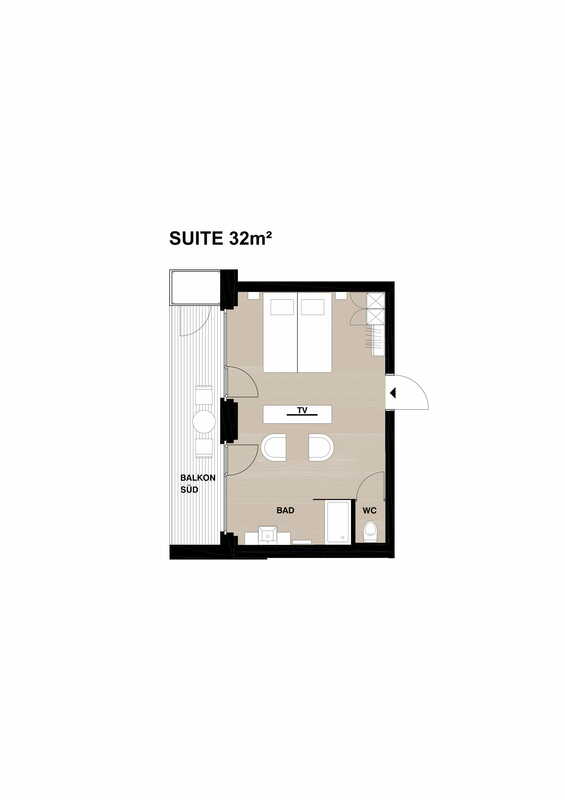 Other extras like comfortable box spring beds (1.80m x 2.10m), a sitting area with fridge, electric kettle and Nespresso coffee machine are completing the sense of wellbeing in this spacious room. Feel at home in this bright Superior Apartment. With the open living-dining area and south-facing balcony or terrace you will find enough space for relaxing or a cosy get-together with your family and friends. The fully equipped kitchenette offers everything a chef needs: electric hob and oven, dishwasher, fondue set, electric kettle and Nespresso coffee machine. The 2 double bedrooms have large and comfortable box spring beds (length 2.10m) that can be separated. The apartment offers a bathroom with shower/WC and a separate toilet. Get a Swiss chalet feeling in this unique holiday apartment. Situated under the roof pitch this apartment offers high ceilings and a stunning view of the impressive mountains from the south-facing balcony. The fireplace completes the chalet feeling of this unit. A kitchenette with dishwasher, electric hob and oven, electric kettle, Nespresso coffee machine and fondue set offer everything you need for an independent stay. The 2 double bedrooms have large and comfortable box spring beds (length 2.10m) that can be separated. The apartment offers a bathroom with shower/WC and a separate toilet. Living like at home - or even better! 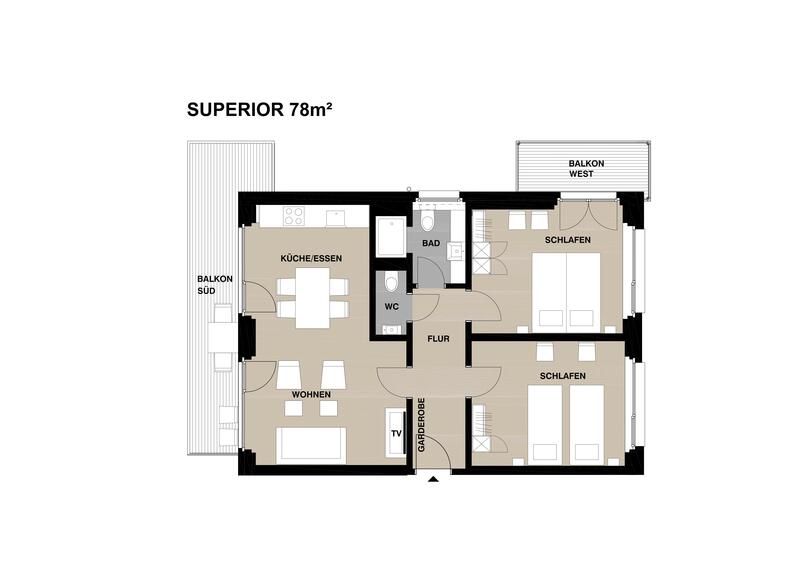 This apartment is just the perfect place for you and your family. Beside the spacious living and dining room, the big garden terrace with stunning mountain view invites to spend some relaxing moments with your family or friends. A modern kitchenette with dishwasher, electric hob and oven, electric kettle, Nespresso coffee machine and fondue set completes this bright apartment. The 2 double bedrooms consisting of modern box spring beds (length 2.10m) that can be separated. 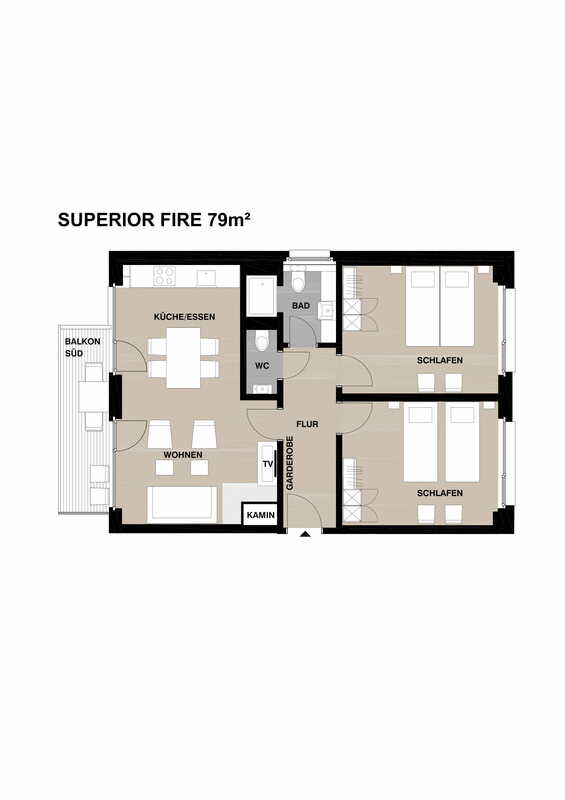 And the two bathrooms - one with a rain shower - complete this spacious apartment. Panoramic windows and south and east facing balconies offer a fantastic view of the surrounding peaks. The fireplace exudes a warm atmosphere in the living-dining room. The fully equipped kitchenette has electric hob and oven, dishwasher, electric kettle, Nespresso coffee machine and fondue set. 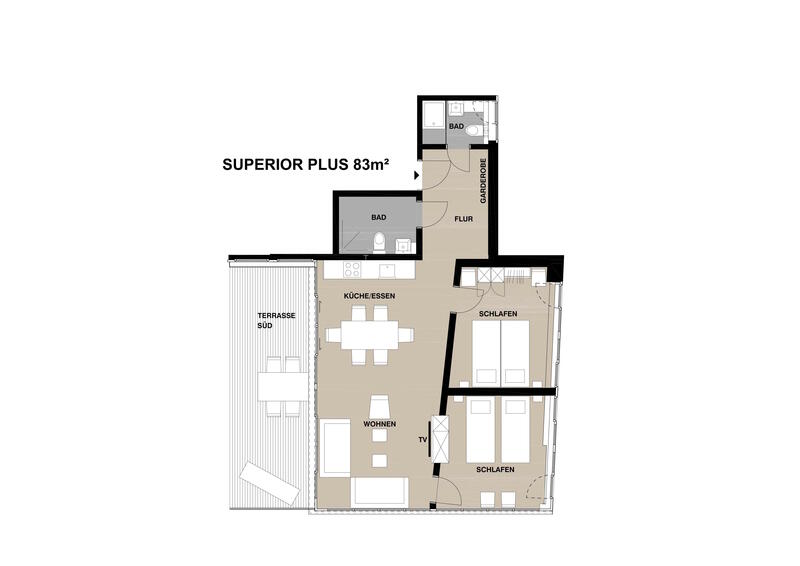 Due to the 2 double bedrooms and the 2 bathrooms with bath or shower/WC - one is designed as an en-suite bathroom - the apartment provides comfort for everyone. Modern box spring beds, which can be separated, sweeten your dreams! 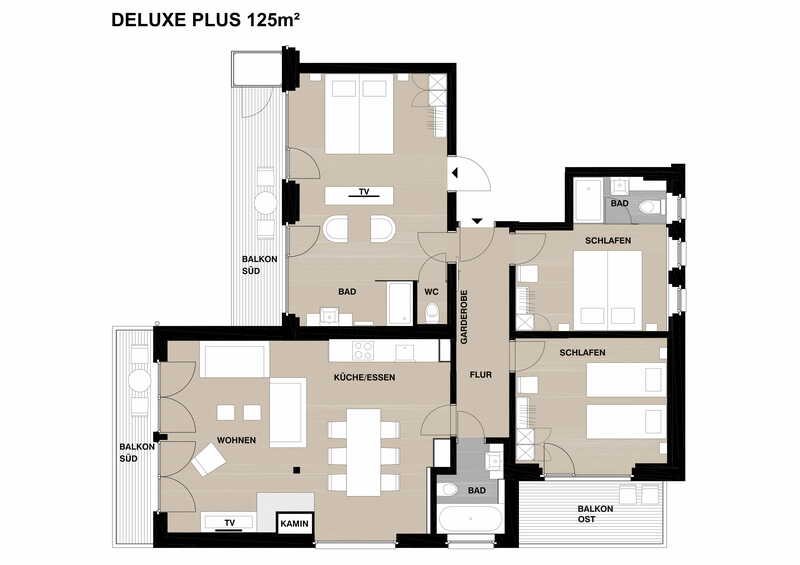 In the Deluxe Plus Apartment you will find enough space and privacy for everybody! 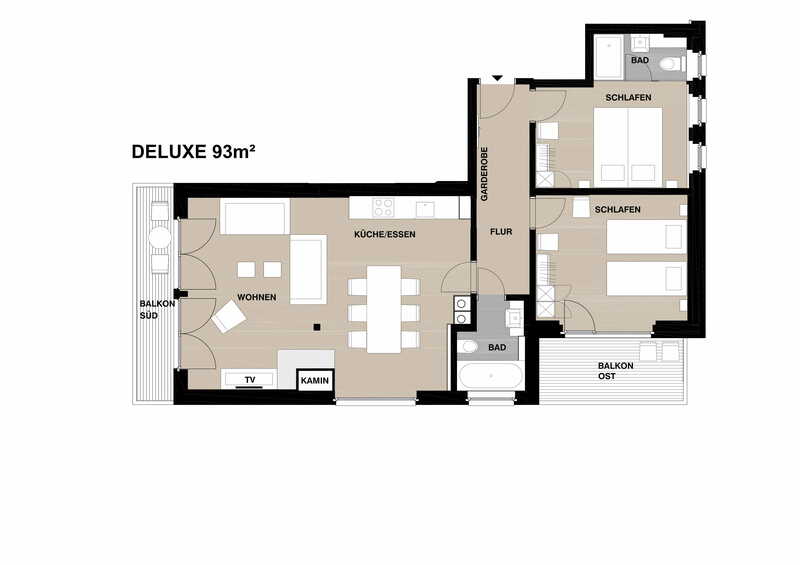 All 3 double-bedrooms have their own bathroom with shower or bathtub. The modern and comfortable box spring beds (length 2.10m), which can be separated, will sweeten your dreams. The fireplace in the living-dining room guarantees relaxing hours after a day full of activities. In the fully equipped kitchenette (electric hob and oven, dishwasher, electric kettle, Nespresso coffee machine, fondue set) cooking is a great pleasure. And the south and east-facing balconies and panoramic windows of this apartment make the Saas mountain world seem even more impressive. Free electric taxi pick up and drop off service on arrival and departure. Rich breakfast buffet between 7.30 am and 11.00 am (early-bird breakfast on request). Free use of the spa with sauna, steam bath and relaxation area including bathrobe and slippers for adults. Free Internet access via Wi-Fi. Free use of washing machine and tumble dryer. Luggage storage and shower facilities on your day of arrival and departure. Feel good in a beautiful ambience and relax in a friendly way with a lot of fresh air and incomparable nature - we have them right on your doorstep. After skiing, snowboarding, sledging, hiking, biking or mountaineering, our guests can relax in our Alpine Wellness Oasis with sauna and steam bath. In the relaxation room with a view of the Saas mountains you can let your mind wander. Bathrobes and slippers for a comfortable spa experience are available on site. Enjoy our rich breakfast buffet with fresh rolls, croissants, wholemeal bread, cereals, yogurt, cheese from the Alp, cold meats, egg dishes, juices, fruits and fresh coffee. Breakfast will be served from 7.30 to 11.00 a.m. - For climbers and other early risers, we offer breakfast on request also earlier. In our lovingly designed breakfast room with a lounge and a fireplace, guests will meet in the afternoon for a cup of coffee, a glass of wine, a nice conversation or an exciting game. On the large sun terrace it is wonderful to relax and linger. Prices: The prices indicated are standard prices and do not include the local taxes. Please understand that late check-outs are not possible. You have the option to leave your luggage in our luggage room until your final departure. There are also shower facilities. Max. 1 dog per suite or apartment. Please contact us directly in advance. Find here our detailed booking terms.